Want to to hear a secret? I’m not a writer either, but still manage to populate my blog with multiple posts every single week. Is it because I love writing? No, it certainly isn’t. Is it because I have oodles of time on my hands? No. I make sure to update my blog on a regular basis because I know the value and the power of consistently putting out quality content. This is crucial for all entrepreneurs, but for professional speakers and coaches it’s incredibly important. Your words are literally what people are paying for, so you have to create enough content to make someone feel confident in hiring you. A blog post doesn’t have to be a thousand word essay! Even though we live in a world of social media and texting and instant, on demand everything, people still want quality content … even if you’re resistant to producing it! The good news here is that a blog post doesn’t have to be a 1,000 word essay about your inner most thoughts on the world. It can be, sure, but it doesn’t have to be. A blog post can be as simple as a couple of sentences explaining why you loved a certain book or article, then sharing the link and asking for comments from people about what they thought of it. A post can be a photo, video, quote, an infographic, or anything you want it to be. And the coolest thing about blogging? 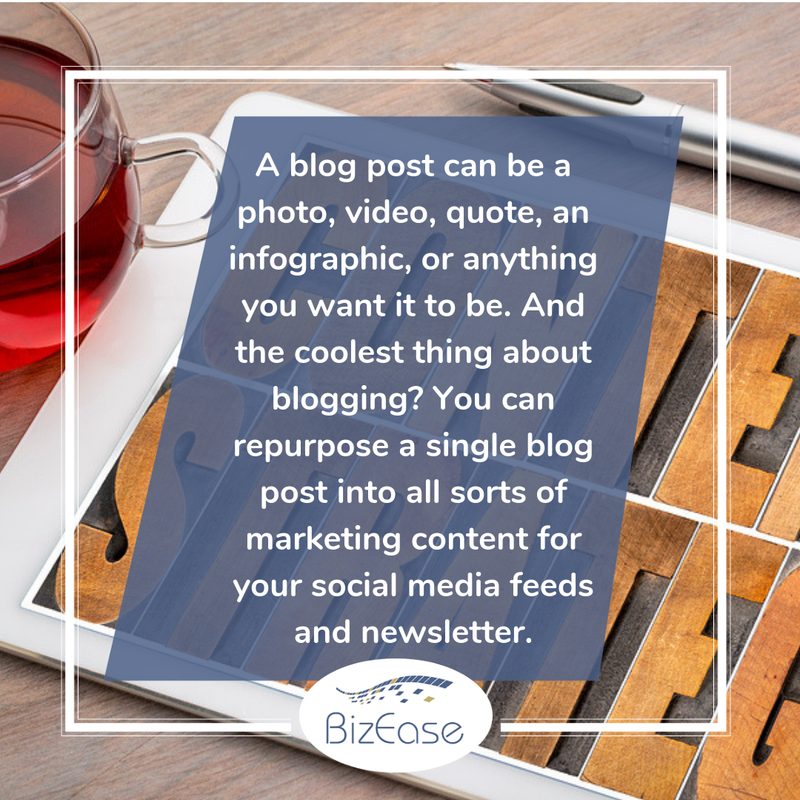 You can repurpose a single blog post into all sorts of marketing content for your social media feeds and newsletter. 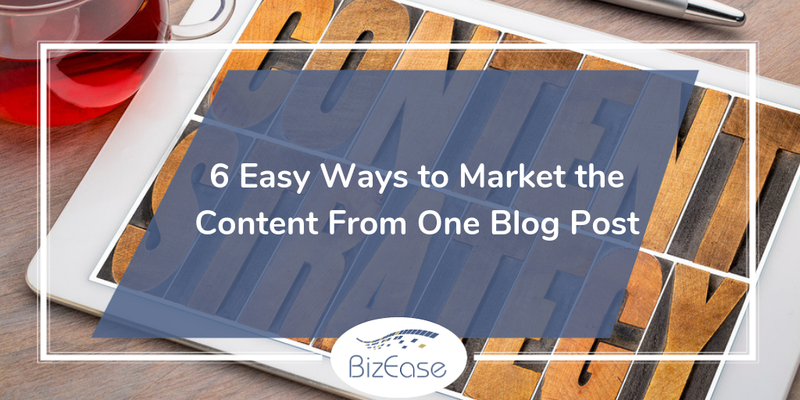 In fact, there are at least SIX marketing pieces you can get from a single blog post. Don’t believe me? Check them out! After you publish your piece, take an excerpt from it and put it up on LinkedIn with a link to the original post. This will get you more exposure, AND it will help reach that important LinkedIn audience. Use your blog post to provide fuel for a podcast episode. This works especially well if you have some comments on the post you can discuss during your podcast. Extrapolate key points from the blog post and use them as graphics to be shared on Instagram … linking back to the original post. If you don’t have the artistic know how, you can use Canva.com for this. It’s very simple to do. Or even better? Outsource the task to a team member. Use a chunk from the blog post in your next newsletter with (you guessed it) a link to the published version. Grab some lines from the post and turn them into Tweets and Facebook posts to be shared across social media channels later. Piece together an Instagram story using bits of content from the blog post, finishing with a link to the post. Even more, you can start collecting your best blog posts and use them for future round up posts, like one I did recently about my most popular posts of 2018. This method becomes effortless if you have a team of online marketing specialists working with you. Our team, for instance, helps our clients with every single step I mention in this article, including writing the post in the first place! I officially think you’re out of excuses to not be writing more content, now … happy writing! Originally published at bizeasesupport.com on February 13, 2019.